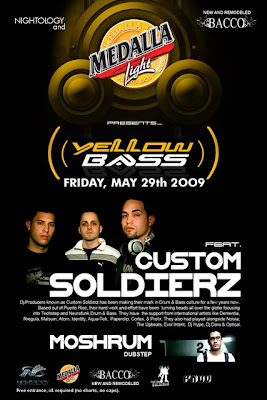 This Friday May 29th 2009, Yellow Bass @ Bacco, Rio Piedras. Massive beats by PR's own Custom Soldierz. This is the first of a monthly series, so don't miss this special event! Also, from PRDC, MOSHRUM dropping some dubsteppin' basslines.